D.C. Council member Jack Evans is now the chair of the board of the Washington Metro Area Transit Authority. 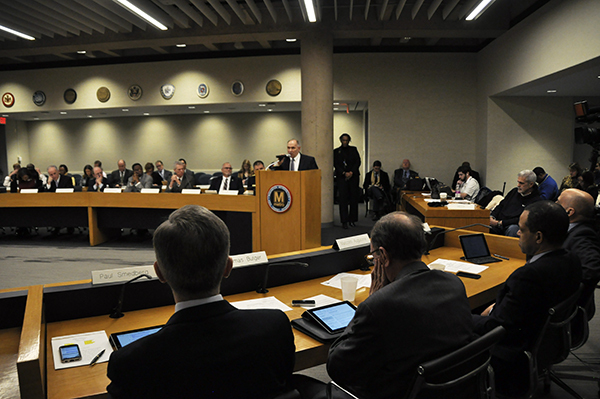 The board convened at its headquarters in the Jackson Graham building last week. Foggy Bottom’s D.C. Council member Jack Evans is now leading the group that oversees the Washington Metropolitan Area Transportation Authority. Evans, who was elected last Thursday after being the expected winner for weeks, has been on the Metro’s Board of Directors since last January. He said his main goal as chair of the board will be to “restore confidence” in the Metro system. “The most important thing we’re focusing on in the Metro is safety,” Evans said. Evans tweeted last week that he would like to increase the police presence and lighting on Metro trains and buses and reduce crowding on the system. He suggested ways to increase advertising and boost revenue across the system several months, which Metro officials later adopted. He said he will talk with WMATA General Manager and CEO Paul Wiedefeld as well as the other 15 members on the board before laying out more specific goals. The Metro has faced multiple public relations issues over the last year, and complaints of delays across the system seem constant. A smoke-filled Metro car at the L’Enfant Plaza Station killed one woman and injured more than 80 others last year. In August, a Metro train derailed outside the Smithsonian Station, causing disruptions on three lines for most of the day, although it was later revealed Metro employees had detected the mechanical issue causing the derailment more than a month earlier. In September, a fire at the Stadium Armory Station led to delays on several lines for multiple weeks. The federal government seized oversight of the Metro system in October following the safety incidents, The Hill reported. Evans said he would like to lobby Congress to gain more federal funding, after federal legislators cut those funds by one-third last year following public scrutiny after the L’Enfant Station incident. Evans has been a long-time chair of the Council’s finance committee and has built a reputation on advocating for construction and development across the city. He was on the WMATA board from 1992 until 2000, and served as chair of the board in 1994 and 1997. Michael Goldman, a lawyer who represents Maryland on the Metro’s board, said that he “fully supports” Evans becoming the group’s chair. He said he thinks Evans’ more than 20 years of experience on the Council will serve him well. “I think his background on the finance committee gives him a good background to get the Metro’s finances in order going forward, as well as his leadership on the Council as an elected position,” he said.